Congratulations! The love of your life has finally asked you to marry them and now you can begin planning the wedding you have always dreamed of. Whether you have dreamt of a small and intimate wedding reception, or a large and extravagant one, the amount of time and energy that is needed for wedding reception planning is immense — which can cause a lot of added stress and and anxiety. During this special time in your life, the last thing you want to be feeling is overwhelmed and stressed out. Instead, you should be enjoying every moment of this celebratory time. 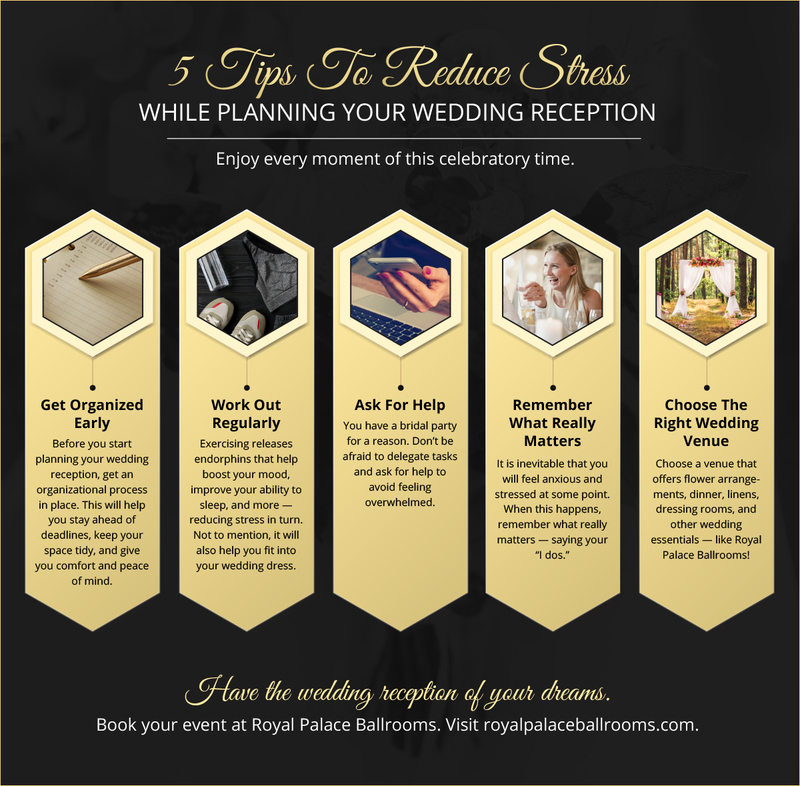 To help take the stress off of your shoulders, Royal Palace Ballroom in Hialeah has put together 5 helpful tips to help you enjoy every step of the wedding reception planning process so you can get the most enjoyment out of this special time in your life. First things first, don’t wait until your dining room table is piled with papers and meetings with vendors are being missed because you made a note of it on an old receipt in your car that didn’t make it into your day planner. Come up with an organization process before you begin planning the fine details of your wedding reception and stick to it. 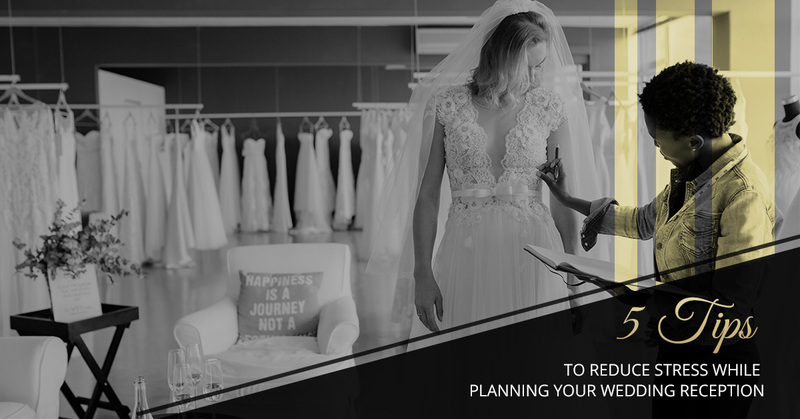 Consider printing off a wedding planning checklist, too, to keep you on top of things that are left to do. This will help you stay ahead of deadlines, keep your space tidy, and will overall give you comfort knowing that you have everything in order. Not only will working out help you feel more confident that you will fit into your wedding dress, but it will also reduce the overall stress of planning your wedding reception. Working out releases endorphins that help boost your mood and improve your ability to sleep — reducing stress in turn. When planning your wedding, it can be easy to want to do everything yourself — especially if you are a perfectionist. The truth is, though, planning a wedding by yourself can be extremely overwhelming and you shouldn’t have to do it by yourself. After all, that is what you have a bridal party for. Don’t be afraid to delegate out tasks to keep you from feeling overwhelmed. Those who love you will be happy to help! The truth of the matter is, you will most likely feel stressed out at one point or another while planning your wedding reception. When you feel this way, however, it is important to remember what really matters — you are marrying the love of your life. Your wedding reception ultimately comes down to the celebration of your unity with the one you love most. In the grand scheme of things, the type of linens of you have, the flavor of cake you choose, what you eat for dinner, etc., don’t matter. Shake off the stress, pour yourself some wine, and cheers to the fact that you’re about to marry your soulmate. The wedding venue you choose can significantly affect your stress levels. Many factors of your wedding, such as having enough space, hiring vendors, and serving your guests, all depends on your wedding venue. If you are looking for a wedding venue that can do it all, check out our ballroom packages at Royal Palace Ballrooms in Hialeah today. Our packages include, open bars, DJ, linens, dressing rooms, formal dinner, cake, photography and video, table set-up, white glove staff service, and more. View our packages for specifications or contact us today to discuss your specific Hialeah wedding reception needs. We look forward to helping you make your wedding dreams come true.